Even if you didn’t know that the Mighty Sensations recorded gospel for the likes of Jude and Down you’d realise straight away from listening to this track that they’d certainly spent a lot of time in church. Love Where It’s At seems to be an amalgam of the soul evergreens “That’s Where It’s At” and “I Found A Love” and as the label says “featuring Jay Bee and Deszie Dee” we can assume that these are the two voices we can hear exchanging those wonderful “yeah yeah” phrases. The group’s other secular 45 “Praying For An Answer” doesn’t have the same magic despite more fine vocals from Deszi Dee and the addition of a horn section. But it has had some dance plays. 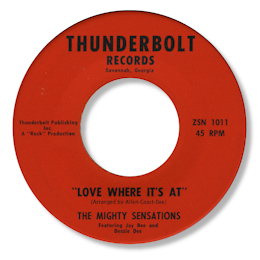 The Thunderbolt label has a Savannah, GA address. UPDATE ~The Mighty Sensations also appeared as the backing group to Thomas Hall on his Diamond 45 - "Do you really love me " / "You told a lie" (Diamond 180) from 1965. Thanks to Bob McGrath abd several other people who kindly contacted me about this. "the Mighty Sensations on Jude and Down are not related to the same-named group on Thunderbolt. The Jude and Down 45s are by a Port Arthur, Texas group." As ever I'm really grateful to Dante for sharing his wonderful knowledge.